Filed to: Happy Pride!Filed to: Happy Pride! More than scientific research goes down in Antarctica. With Pride Month officially starting Friday, celebrations are popping off at all ends of the world—including near the South Pole. Who said a continent devoted to ice, climate and Earth science can’t also be a place for the queerios of the world to party? After all, we already know penguins are a little gay! 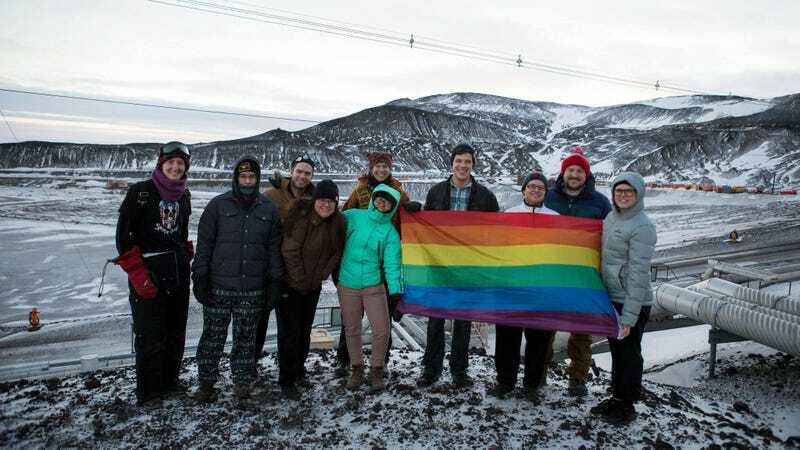 Employees based at the McMurdo Station, the largest research station in Antarctica located on the edge of Ross Island, are set to hold the first-ever Pride celebration June 9. The party will happen at a bar on-station—set with games and/or movies, said Shawn Waldron, an organizer who works with the station’s support crew, to Earther. They’re still figuring out the logistics, though they had to hurry up and take a photo with the rainbow flag in April before the darkness that envelopes the continent every year from June to September arrived. Rainbow Antarctica stickers Mark Vogler received while out there earlier this year. The penguins are so down! None of the National Science Foundation researchers who work at McMurdo are really involved because, well, only two researchers remain at the station during this off-season, according to Townsend. (During summertime, the station holds more than 1,000 people, to compare.) But the current 133-person crew that hangs around year-round are equally important. They’re the ones who prepare the station for the summer by completing tasks there’s no time for during the height of research season—like repairing vehicles and equipment. When summer is in full swing, these crew are charged with maintaining the galley, bartending, and cleaning the bathrooms. As it turns out, this year’s Pride celebration won’t be the first time McMurdo’s staff unite over their queerness. About 15 people in the team identify as LGBTQ, so topics like LGBTQ custody battles are welcome at the dinner table, Townsend said. Mark Vogler, also with support services who worked as a janitor, was out at McMurdo from January to March. He missed the Pride photo, but he said the continent was full of pride year-round. When he first arrived, he was surprised to see two men dancing together at a bar on the station. That sort of thing is normal at the station, apparently. An LGBTQ social event at McMurdo Station. At McMurdo, people are working under conditions where death is always a possibility. The conditions are especially rough during the winter (hence why the researchers dip). The current temperature is negative 5 degrees Fahrenheit with a negative 22 degrees Fahrenheit wind chill. In this kind of environment, the team members need to know they can rely on each other, Vogler said. They also need the ability to be their most authentic selves after the long work day. While this will be the first-ever Pride celebration to reach the southern continent, the gays had already claimed Antarctica. In 2016, Aaron Jackson, president of humanitarian nonprofit Planting Peace, was down in Antarctica flying his rainbow flag loud and proud. He returned to the U.S. and declared Antarctica “the first LGBTQ-friendly continent.” Jackson was excited to hear about this recent gathering. “It’s amazing to see pride in all corners of the world,” he said in an email to Earther. Aaron Jackson raising the rainbow flag with his (potentially gay?) penguin friends. The folks brave enough to spend months working in Antarctica each year are the only source of culture in the region. It’s up to them to create a welcoming environment. Preach. I know where I’m visiting next.